In my 7 years on here I have never started a thread. Maybe I can bring the MoJo. Indices and forecasts seem to be lining up for a wintry January in the Southeast. I honestly don't know how to feel about things going forward. I think there is a lot of potential, but I am concerned about the lack of true cold so far, not just around here, but nationwide. Despite the early signs of blocking we still don't seem to be able to get that in winter, and it's frustrating we're already playing the SSW card in hopes of getting some to come our way. The only thing that seems to be working out is the (endless) rainfall, but we need the cold. When I say we, I mean everybody outside of NC that got burried a couple of weeks ago and have gotten in on several small events already. I said before I fear this is going to be an I-40 /north or even state line/north winter, despite all the positive factors leading in, and that fear has not abated. Above normal in Alaska is the gift that keeps on giving. Bring it! Yeah that's the best forecast I've heard from the fed level NOAA in forever. I'm still waiting for things to fall off the rails but it hasn't. The back of my mind I'm thinking I got my 5 inches for the year, I don't deserve/won't get anymore statistically speaking. Hard to believe everything's lining up for a really great January and February. Cautiously optimistic. Very cautious. I live in Northeast Georgia, and based on the forecast for the next 10 days, it's almost certain that we will have another above-normal December in terms of temperatures. That makes 8 AN Decembers in a row, going all the way back to 2011. Is that some kind of record? Have there ever been any other months for which the temperatures were above normal 8 years in a row? Yeah the rain has been incredible, crazy to see so many multi-inchers one after another. Seems we've been pretty paltry with the highs and the cold, other than our Dec storm, and even that was borderline for most. I remain hopeful, as even the upstate has nine more weeks we could legitmately see snow, but I'm getting that sinking feeling that many of the ingredients we were looking at a few weeks ago aren't coming together. Maybe I'm just being inpatient, as this is "supposed" to be a back loaded winter setup, but I just haven't seen too many signs of bona fide cold yet, anywhere in the country. 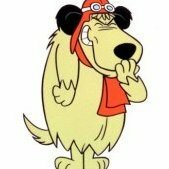 I know the SSW event has the potential to help with that, but it may also not help us at all; and we always seem to be Charlie Brown with the SSW and -NOA being the footballs. I agree that MA and NE are probably golden this year, but we've got to get a lot in our boat south of NC to get anything. That's another reason why I hated to miss the big dog a couple weeks ago. Despite the common view it was a "bonus" snow, it could also end up having been our best chance all winter in this area. 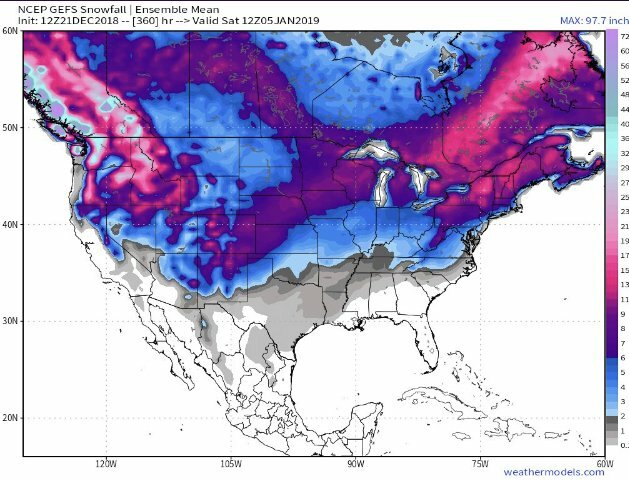 You never know, here's to a big pattern change after mid Jan! It's just a bit of a gut punch looking at the mid range forecasts and seeing nothing below normal for at least a couple weeks. Just seems like the new norm to be a week or so away from Christmas and searching 10, 15,20 , days ahead to look for the big chill and pattern change!? It’s almost like clockwork! We have the magical unicorn ready to pull out of our butts ( SSW) to make the cold and snowy pattern set up, but that’s far from a certainty! I look forward to the snowman pics from Iran and Egypt in the upcoming weeks, as the split goes the wrong way for us! Well the 2010s have definitely been noted for some impressive winter torches, but to be fair the historic cold last year set in right after Christmas. Overnight LR guidance looking pretty good. Lots of good signs showing up as we get into January! Well it snowed the day me and my wife went to the hospital to induce her labor for my son to be born. Both his 1st and 2nd birthday parties were affected by snowstorms and had to be moved up a day early and his 3rd birthday is Jan 5th. If the trend keeps up then we should see some snow that weekend. Totally non-scientific but hey a trend is a trend! I don't know what y'all are looking at. All of the indices except the PNA are going in the wrong direction or are neutral. CFS is blowtorch across most of the continent as we head into January. The SSW probably won't result in a full PV split and may not propagate downward. The models are slowly backing off that solution. 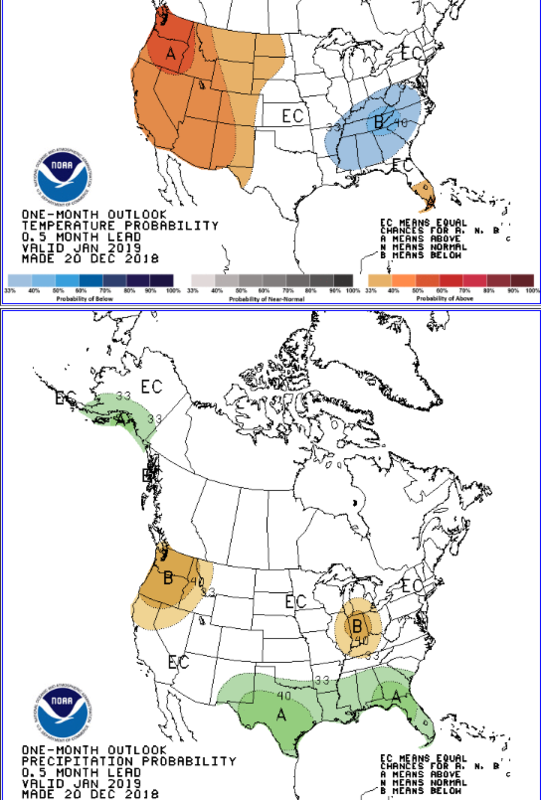 There's a chance of a cold January, but it's far from likely TBH. I see that you are back to your old self, now that all your snow has melted. But it's 384. The 384 from yesterday's GFS (which is now 360) had significant ridging on both the east and west coasts, with a minimal trough in the middle. Not very cold, but certainly a nice hit for the same areas that got hit 2 weeks ago. Euro woof woof. Happy New Year! 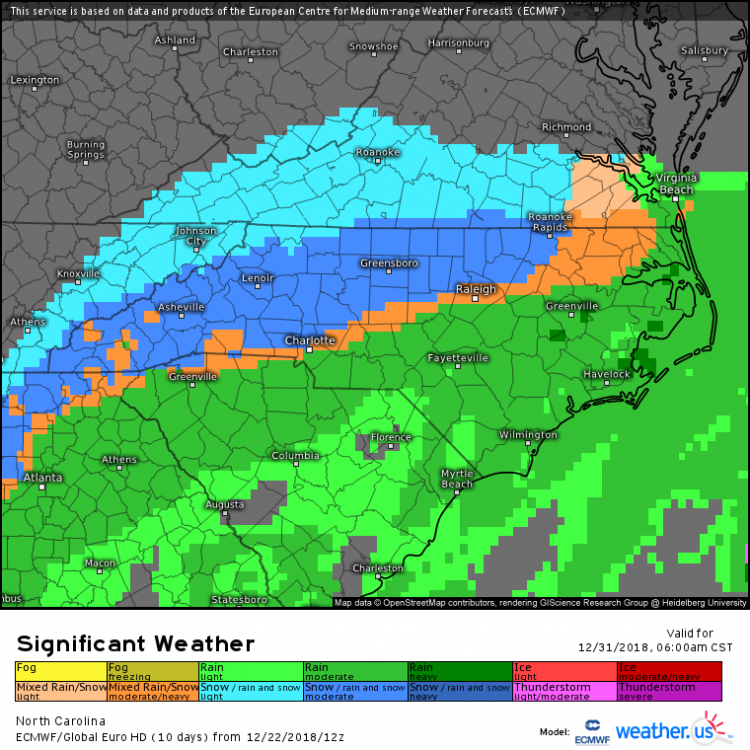 https://weather.us/model-charts/euro/north-carolina/snow-depth-in/20190101-1200z.htmlThis looks pretty good too. Yep, the rich getter richer. Wow an I85 transition line. Who'd have thunk it? Basically zero EPS support for that solution or any snowstorm where the OP has it painted.